Prominent & Leading Manufacturer from Chennai, we offer titanium anode hooks, titanium gr.9 component, titanium machined parts, titanium c clamp for anodising, titanium wave solder fingers and titanium springs. Anode hooks are made Hooks can be made according to customer specifications and requirement. 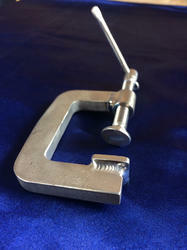 While anode hooks usually carry not more than 30 amps, 3/8″ square hooks will handle as much as 40-50 amps. 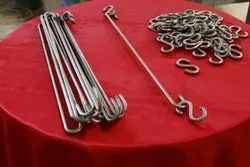 Copper and Steel Hooks will carry much more. 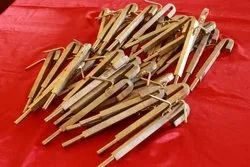 All anode hooks are made dimensionally true so that anodes will hang straight. UNIFORCE ENGINEERS is one of the prominent fabricators of reactive metals including titanium, zirconium and high nickel alloys fabrication. With the our in bulit facility in Chennai, India, UNIFORCE serves a broad range of industries including: Chemical/Petrochemical, Oil & Gas, Pulp & Paper, Mining, and the Military. Primary materials of construction are titanium and zirconium, but the company also fabricates with high nickel alloys including Hastelloy®, Inconel®, Monel® and more. 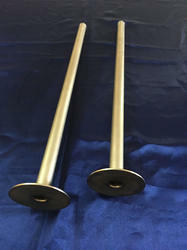 In the picture shown is Titanium Mast Interface made of Titanium Gr.9 material to be used in Sub Marine. Titanium fabricated C clamps developed by us are widely being used in Anodising Industry in our country. Sizes are customer specific. Titanium Fingers made from 1mm thk, 1.2mm thk and 1.5mm thk are supplied as retrofits for any model wave soldering maching. 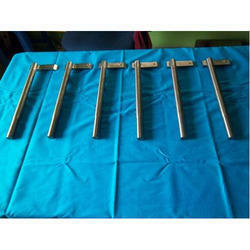 We manufacture titanium wave solder fingers as per production sample provided by our customer. We also export these fingers. 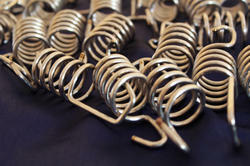 Titanium Springs are used in Titanium Anodising Frames / Fixtures for holding aluminium profiles/components. We are one of the very few manufacturers of titanium springs for customer specific applications.These springs mainly being used as hooks for holding complex aluminium parts for anodising. Uniforce is one of the leading manufacturer and Suppliers of Titanium Thermowells/Titanium Thermowell Sleeves to RTD and Temperature sensor manufacturers as OEM. 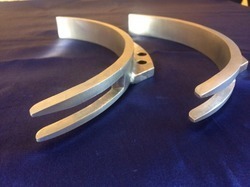 We offer Titanium Fabricated Sleeves as well as machined from bar stock. Our preciously machined components ,from commercially pure grade titanium are used in Metal finishing Industry ie in special processing units as fixture for anodising. 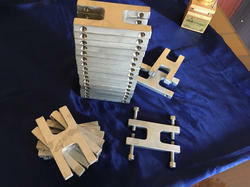 Titanium clamping blocks with Allen cap screw set are manufactured from commercially pure grade titanium materials. This is a custom built product for specific application which finds application in special processing industry for aero space parts. The function of an acoustic cleaner is simple, compressed air is introduced through a specific orifice and causes the titanium diaphragm to flex. The flexing causes a pressure pulse to be produced that is then amplified by the bell. The length and flare constant of the bell is what determines the fundamental frequency. The sound pressure produced by the bell causes particulate deposits to resonate and dislodge. Once dislodged, the material is removed by gravity and/or gas flow. Acoustic cleaning is a non intrusive technology designed to remove particulate buildup wherever ash, dust, powders or any other dry materials cause buildup, blockage, or thermal transfer problems. 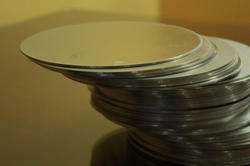 Uniforce manufactures and Supplies Titanium Diaphragm Discs for Major "Acoustic Cleaning System " suppliers in India. 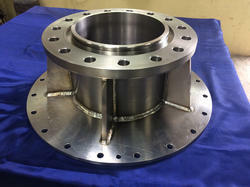 Titanium retrofit parts are normally manufactured as per customer drawings/specifications after carefully evalutaing material grades and corresponding properties. Titanium retrofits, at times supplied as substitution for imported parts and they call for critical dimensional tolerances and exceptional surface finish. 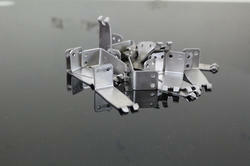 These parts are used in drycell manufacturing line. Titanium pressed and accurately machined Pressures Rings have been supplied to Marine application as per our client's specific request. 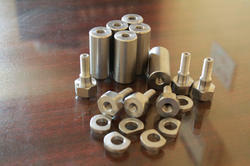 Titanium GR.2 components manufactured and supplied as per customer specifications. 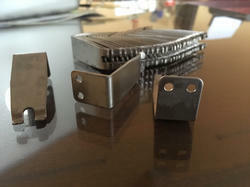 These titanium parts are used in Drycell Manufactureing plants. 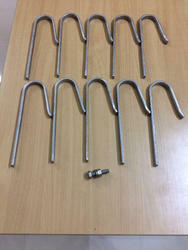 Titanium "S" hooks and Long hooks are specially made for anodising large identical components. These are desinged and supplied as complete set. Non critical desing 100% outcome on coating no jig marks. 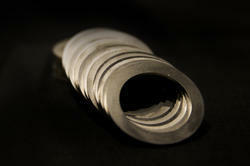 We offer a wide range of Titanium Wave Solder Fingers as per the requirements of our valuable customers. Keeping a tab on the industry advancement, a group of well qualified and experienced professionals design these products by making use of best grade components and advanced technologies. These products are used are available with us in different stipulations to meet the diverse demands of the customers.